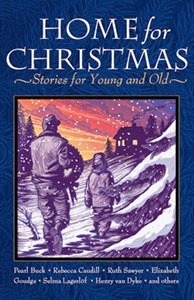 Home for Christmas: Stories for Young and Old is a collection of twenty stories appropriate for family sharing. Authors include Madeline L'Engle, Pearl Buck, Henry van Dyke, Katherine Paterson, Jack Schaefer, Ruth Sawyer and others from familiar children's literature and from unfamiliar European tales. Accompanied by beautiful woodcut illustrations, the stories in Home for Christmas are perfect for reading aloud during the holidays, or anytime. The stories in Home For Christmas evoke different feelings and memories, and they all complement the themes of giving, kindness, love, joy, peace, and good will. I think all of this makes Home for Christmas a wonderful resource. The publisher provided a review copy for my honest opinions.